The EN 14491:2006 “Dust explosion venting protective systems” was revised and the new EN 14491 released in August 2012. Because the new EN 14491:2012 contains several changes, it was necessary to update the WinVent 3.1e to WinVent 4.0 to guaranty that it represents still the state of the art. The new WinVent 4.0 is mainly based on EN 14491-2012 “Dust explosion venting protective systems”, VDI-3673, Part 1-2002 “Pressure release of dust explosions”, EN 14994-2007 “Gas explosion venting protective systems” and EN 14797-2006 “Explosion venting devices”. The software calculates all required information of the protective measure “Explosion Venting” for different equipment and enclosures containing dusts, gases, or hybrid mixtures. The calculations apply to single equipment where appropriate explosion isolation measures have been taken to prevent flame propagation into other connected equipment. Complete calculations are given by the maximum recoil force, the duration of the recoil force as well as the transferred impulse, the maximum flame length, flame with and external pressure in the vicinity of the vent opening. If inputs are not according to the standards, WinVent 4.0 informs you and indicates incorrect inputs. WinVent 4.0 is optimized for tablet PC with touch screen. Free update via Internet (software, application, manual, help and masks). Various small "nice to have". 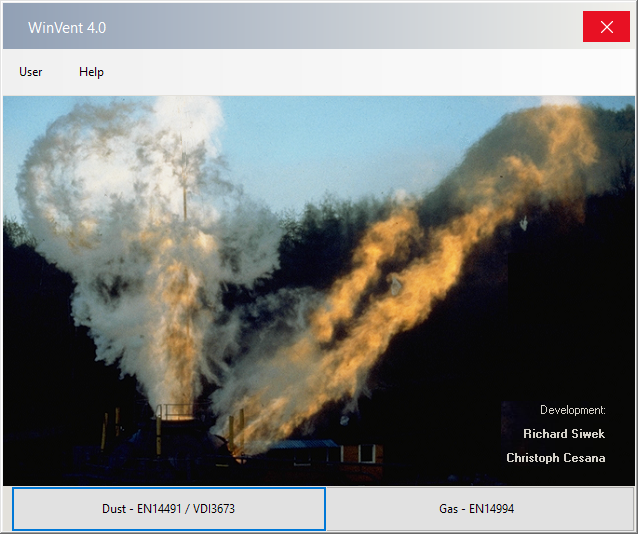 The WinVent 4.0 software can be downloaded and installed. But until registration the program has only restricted functionality. You can order WinVent 4.0 by email at r.siwek@fireex.eu or info@cesana-ag.ch and you will receive an invoice. After receipt of payment, we send an email with the registration code.